ILYG | What Does ILYG Mean? ILYG means "I Love You Guys" and "I Love You Girls". The abbreviation ILYG is commonly used between a group of friends to express an inclusive affection that binds the group together. It is typically used as an expression of gratitude in response to a favor or an act of kindness. 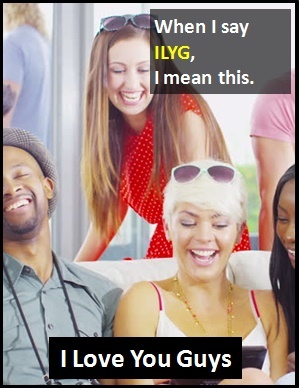 ILYG can be used with the meaning "I Love You Guys" to refer to a group of men and women. It can also be used with the meaning "I Love You Girls" if the group is all female. ILYG is a term of endearment. Colin: Hope you're feeling better. We all miss you. Everyone: We're taking you out for a birthday treat. The abbreviation ILYG typically used as a declarative sentence with the meaning "I Love You Guys" or "I Love You Girls". A declarative sentence usually acts as a standalone statement and is not normally used as apart of a wider sentence. ILYG is an initialism abbreviation. Technically, this means it is pronounced using its individual letters (i.e., Eye Ell Why Gee). However, it is not often uttered using its letters. In other words, the abbreviation ILYG is for efficiency in writing and not efficiency in speech. What Did We Used To Say? Before the digital era, we would have just said "I Love You Guys" or "I Love You Girls" instead of using ILYG.